Middleworld by J&P Voelkel is a wonderful book. It is about a young boy named Max who lives in Boston (woo hoo!) and is a all-American style kid. Over summer break when his parents are (supposed) to go to Italy with him they completly blow that idea off and go on a trip to (fictional) San Xavier. His parents are crazy archilogists, who go on a lot of trips to "digging" sites. Soon he finds out that his parents got lost, almost as suddenly as that sunk in to Max, his housekeeper, Zia, buys him tickets to San Xavier. Soon after he boards a plane to find his parents in San Xavier. When he gets there he meets a mysterious girl with two companion monkeys. She calls herself Lola and Max' life takes a turn that enhances each emotion differently, for the better. I think people in 5th grade will like this book because it makes many references to Mayan culture (I read it at the end of 4th grade). For younger children this book might too confusing because there are so many different (not to mention, foreign) names that you have to keep track of. Older people might think that it is a bit young because of the plot line. Then again, if you are interested in Mayan culture you'll love this book! MAGGIE MAGGIE MAGGIE MAGGIE MAGGIE!!!!!!!!!!!!! IT'S MAYA!!!!!!!!!!!!!!!!!!!!!! I'M BACK BABY!!! Great review! 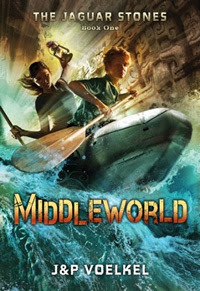 My son and I both loved Middleworld. We both thought all the stuff about Mayan culture was fascinating, and it was a good mystery and fantasy. I enjoyed your review - you did a good job describing it without giving away any spoilers! and YAY you are Maya!!!!!!!!!!!!!!! !